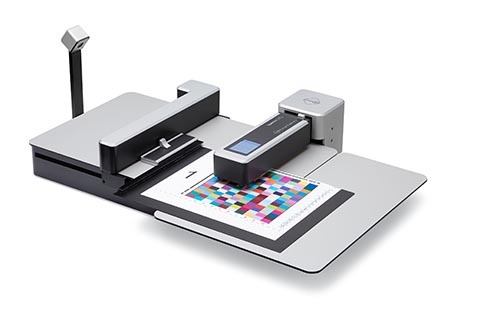 In order to print color accurately every digital printer needs to be linearized and profiled and process control is needed to monitor color output. For this color measuring devices, spectrophotometers, are fundamental. But everyone involved in digital textile printing knows: The fabric to be measured must be fixed in some way on an even surface with right white backing. During measurements the textile shifts, and wrinkles arise. It’s impossible to place certain fabrics in order the chart is a perfect rectangle - it is always distorted in some areas. The optics gets clogged by textile fibers. All these difficulties make it almost impossible to measure fabrics in an automated way. And if, in some way, measurements have been received, they are not accurate and repeatable. The Spectro LFP qb Textile Edition is the answer to all these obstacles: it grants easy and secure fixing of the textile, measures fully automatically with highest precision and repeatability also distorted charts and the optics remains clean for many measurements. To ensure this, new textile holders have been created which fix the chart to me measured. Also, the optics have been equipped with an air blowing system which prevents the textile fibers to contaminate the optics. The most important new feature is the automatic patch recognition: the Sensing Unit (camera) in combination with special software algorithms detects the center of each patch of the chart to me measured. Once the coordinates of every patch are known, the device starts the measurements and thanks to this, distorted charts will be measured fully automatically. The combination of up to 8 mm large measuring aperture and the 45°/0° geometry as well as fully automatic measurements ensure highest accuracy and repeatability. A daily task in digital textile printing is also reproducing spot colors. For this application the Spectral Unit (measurement head) can be detached from the automatic table for manual spot measurements. The fact that the same device is used for spot measurements and for automatic printer setup grants consistency over the whole workflow. And finally, fluorescent inks in textile printing are rampant, and Spectro LFP qb Textile Edition can measure them! Come to see the new Spectro LFP qb Textile Edition at FESPA Global Printing in Munich on Hall B4 Stand J80a and ITMA in Barcelona.